I'm sure Jason's going to be writing about this set soon, but I figured that I'd scoop him a bit. I picked up this Taiwanese set on eBay recently. 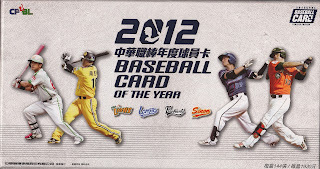 It's called the "2012 Baseball Card Of The Year" set and it appears to be produced by the CPBL itself. 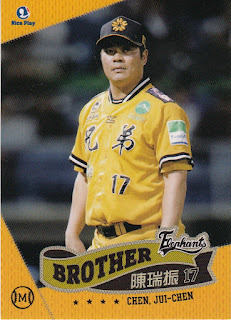 I originally thought that this was a set that had just come out a few months and covering the 2012 CPBL season. It turns out that I was off by a year - the set came out in early 2012 and covers the 2011 CPBL season. The set comes in a very nice box. The box I got was opened but my impression was that it was a complete base set. I'm not positive that it is, however. I got 153 cards but the checklist inside the box lid lists team cards for cards 154-157. I don't know if they are considered part of the base set or not. 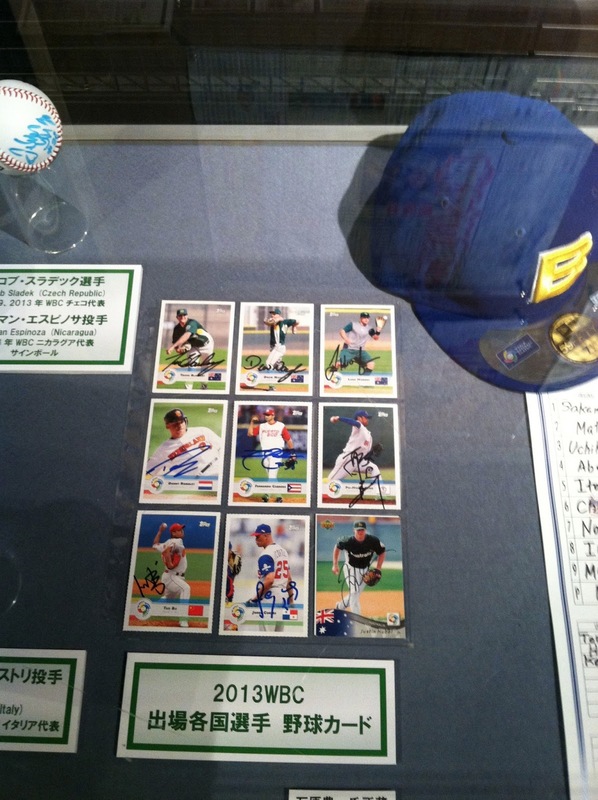 There are all sorts of insert cards available - not sure how many are normally included with the set. 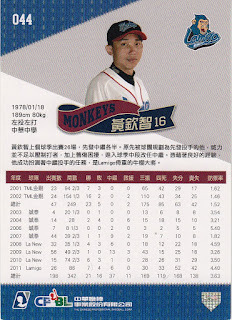 The 153 cards that I did get are all player (and manager) cards for the four surviving teams in the CPBL. 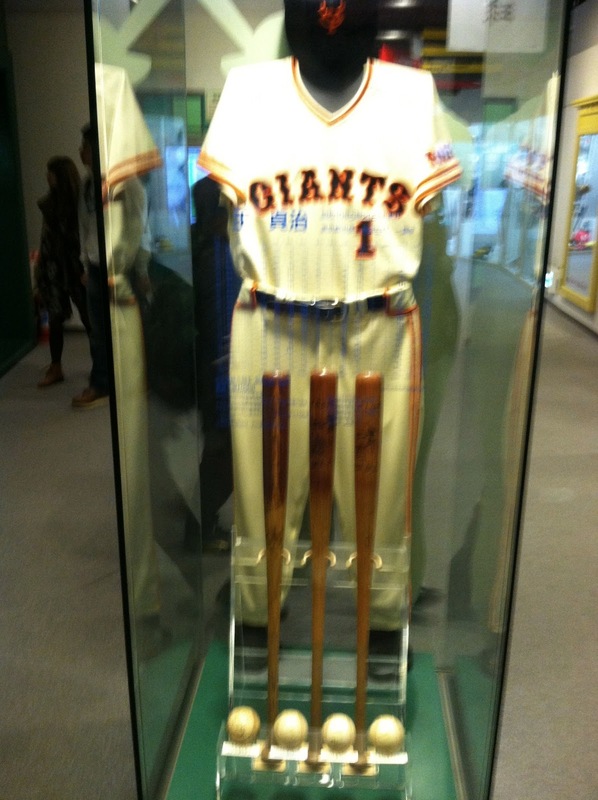 At least in the base set, there are no cards for statistical leaders, award winners or record breakers. Unlike BBM's "flagship" sets in Japan, there is a different number of cards for each team - 37 for the Brother Elephants, 43 for the Lamigo Monkeys, 31 for the Sinon Bulls and 42 for the Uni-President Lions. 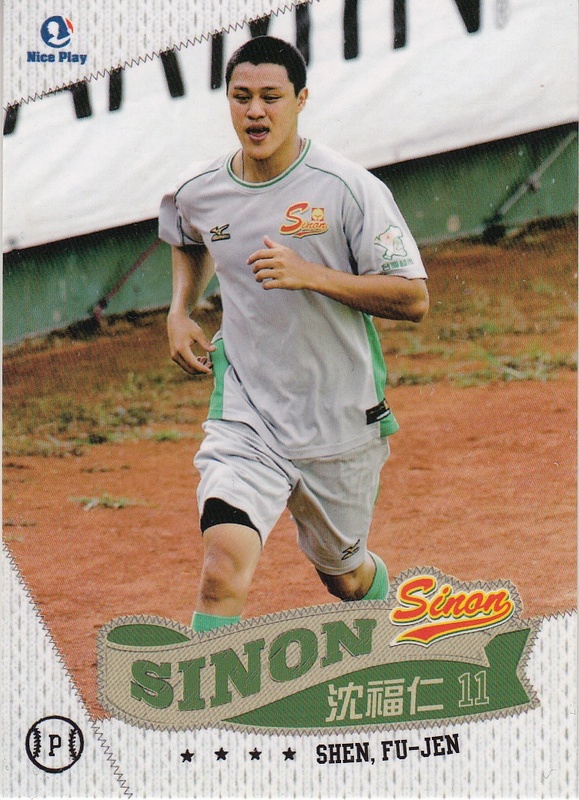 For the most part the photos are game action shots although I did notice a couple cards featuring the player in a training situation rather than a game. 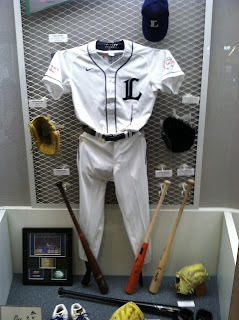 There are a number of Westerners included in the set - John Halama, Ryan Glynn, Adrian Burnside, Bryan Corey and Daniel Reichert were the most recognizable names. 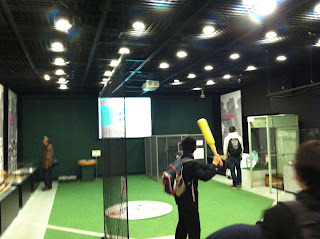 It looks like all the Westerners are pitchers. I guess I was vaguely disappointed with the set. The card design's a little busier than I like. 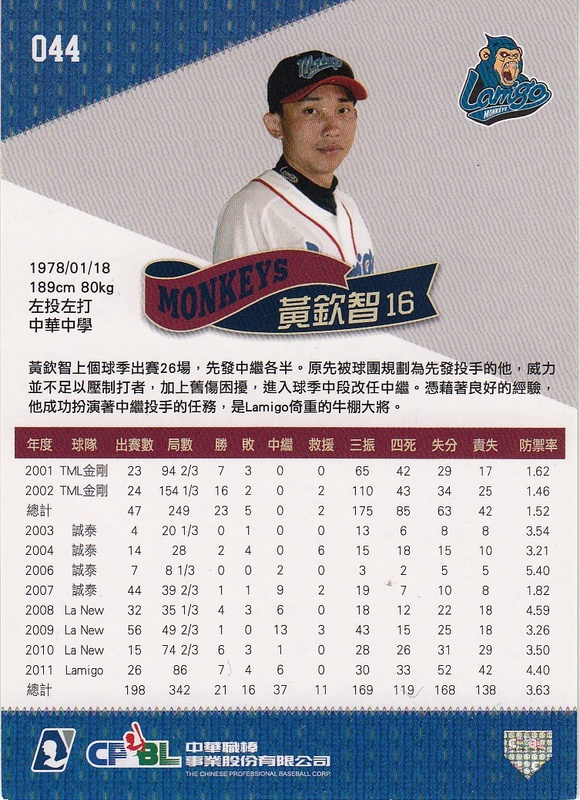 I don't know much about the Taiwanese league so I was not pleased that there were no cards that gave some hints about who the better players are. I think if I had it to do over again, I'd probably not pick up the set. 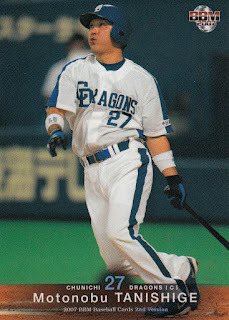 - The Baystars 20th Anniversary set does not quite follow the "standard BBM team anniversary set" pattern. There's only 81 cards in the base set (instead of the "standard" 99). 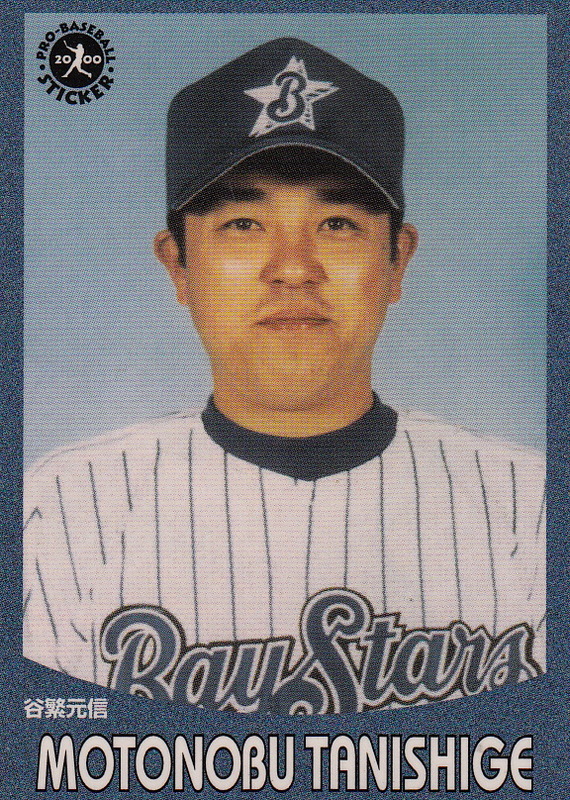 There are 57 cards for OB Baystars players, 18 cards for the current team, 3 cards highlighting former managers (not sure if they are only featuring three former managers or if they'll have all former Baystars managers on the three cards - there have been eight managers including two separate stints by Akihiko Ohya) and 3 "Baystars Scene" cards. There's also a nine card "Dream Team" insert set and lots of memorabilia cards. The set will be out in late June. - The BBM Classic set will have 108 cards in its base set. There will be 72 cards of current players (6 per team) that will use the design of the 1991 BBM set. 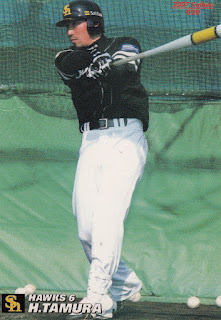 There will also be 36 cards of OB players that will use the design of the 2002 BBM All Time Heroes set. There will be three insert sets that reuse the design from an earlier insert set. There's a 24 cards "Rivals" insert set that looks like the one for the 1997 BBM set (two die cut cards per team that match up together), a 12 card "00's Best 9" set that uses the design of the "90's Best 9" insert set from the 2000 BBM set (the title of this set makes no sense at all - I assume it's one card per team and there's 12, not 9) and a 12 card "Above Average" set based on the insert set with the same name from the 1999 Diamond Heroes set (I assume again one card per team). 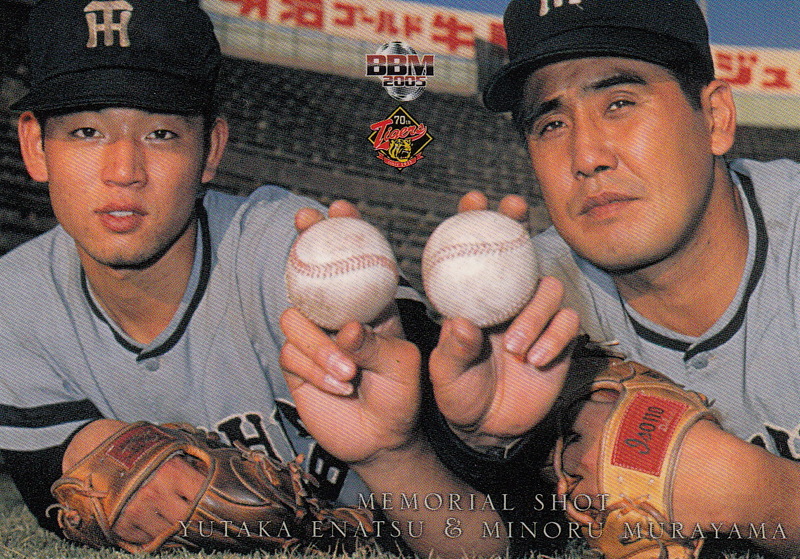 The memorabilia cards appear to be either jersey cards that use the 1997 Diamond Heroes jersey card design (the first jersey cards offered by BBM) or autographed cards. 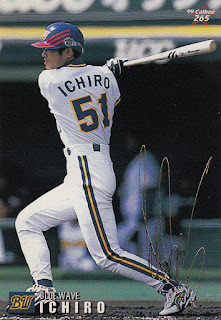 I think the autograph cards are actual old BBM cards that they've had the player sign but I'm not positive. The set will be out in late June. - There's a new "OB Club" set being sold by the Japan Baseball Promotion Association (formerly the All Japan Baseball Foundation). It's a 41 card box set featuring 40 "regular" cards and one autograph card. 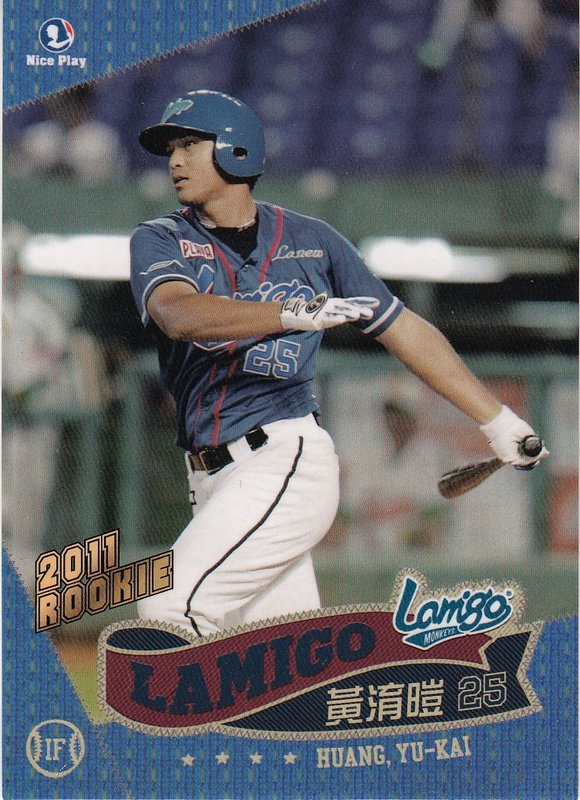 The theme of this set is Rookies of the Year Award winners. The award winners included go back as far as 1952 (Futoshi Nakanishi) and as recent as 1998 (Tatsuya Ozeki) and also include Shigeo Nagashima, Koichi Tabuchi, Akinobu Okada and Tatsunori Hara. 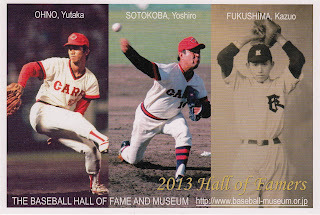 I think it will be interesting to see if the set features pictures of the players from their award winning season - there's a couple guys included from teams that were only known by that name for a couple years (Takeshi Yasuda of the Yakult Atoms and Satoshi Niimi of the Niitaku Home Flyers) so it'd be cool to see cards of those teams. I think the set will be out on July 27. I was very excited during my visit to Japan back in March to score a card of a player from the Nishi Nippon Pirates. The Pirates were one of the seven new teams that came into being in 1950 when the two league system started in Japan. They only lasted the one season - they ended up merging with the Nishitetsu Clippers to become the Nishitetsu Lions (which are of course now the Saitama Seibu Lions). Until I had gotten the card, I had never actually seen a picture of a Pirates player. Well, now I've seen two - I picked this bromide card up on eBay in the last month. It's from the set that Engel refers to as JBR 2 "1950 Black & White Type II". 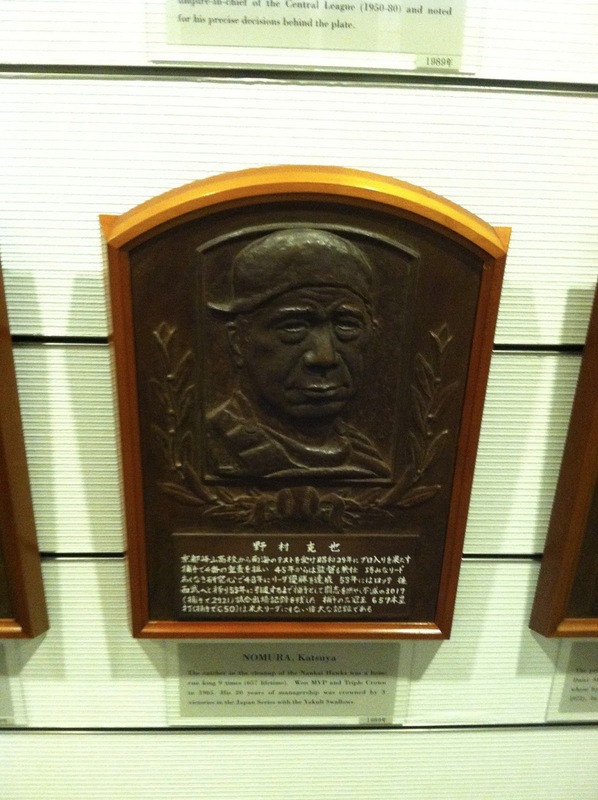 It depicts Yuko Minamimura, who was a 33 year old rookie with the Pirates. 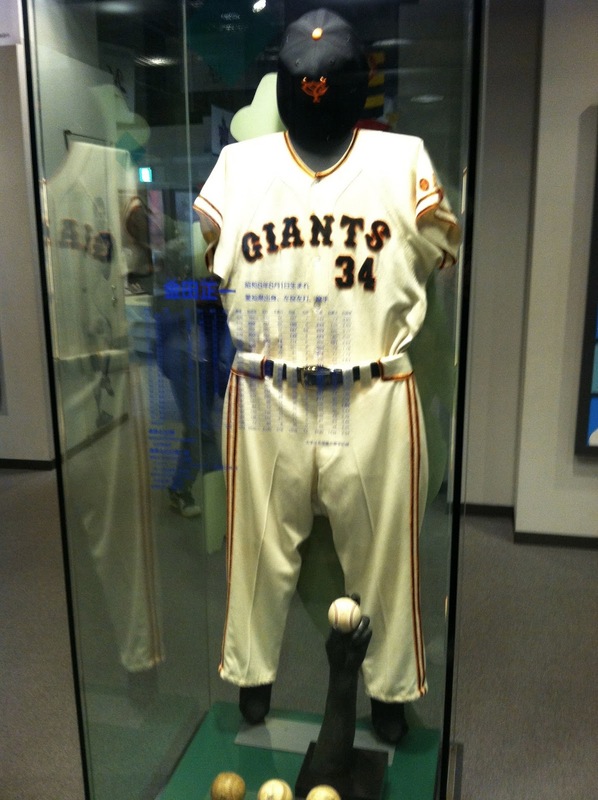 He would go on to play seven years with the Giants after the Pirates-Clippers merger - he was the MVP of the first Nippon Series that the Giants won in 1951. - Calbee released information on this year's Series Two the other day. 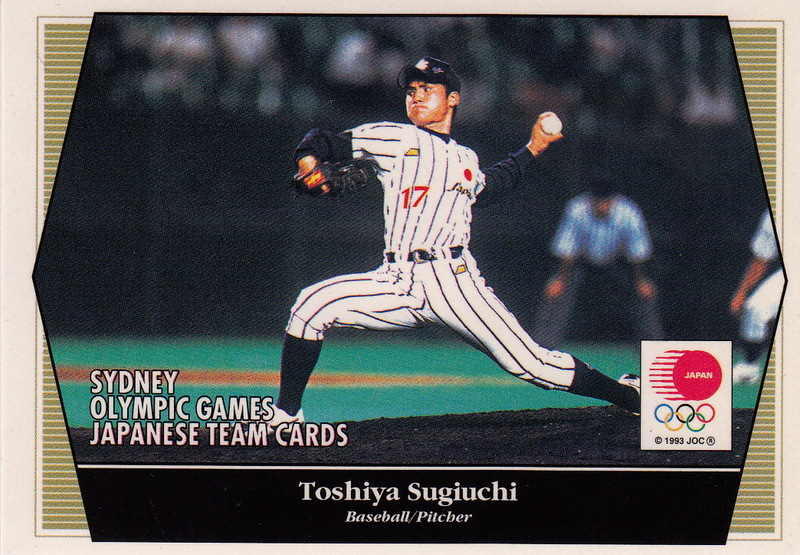 They've increased the number of "regular" cards in the set from 72 to 84 this time around (7 per team instead of 6) but, like Series One, they only have two subsets - a 12 card #1 Draft Pick set (one per team) and the four card checklist subset (continuing the team mascot theme from Series One.). 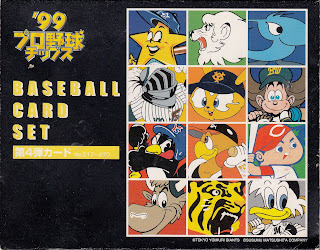 There's also the 24 cards "Star" insert set (2 players per team) along with a 12 card "Speed Star" box set that is only available through some sort of online sale. The chip bags hit the stores on June 24. 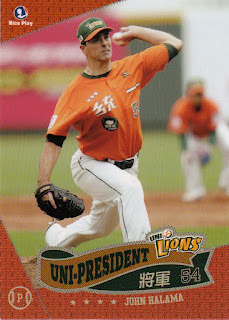 - BBM listed two more team sets on their website - the Fighters and the Lions. Both are pack based sets that will feature 99 base cards each along with various insert and memorabilia cards. They'll both be out in last June. - I saw a couple interesting upcoming sets on Discount Niki's site that haven't had a formal announcement on BBM's site yet. 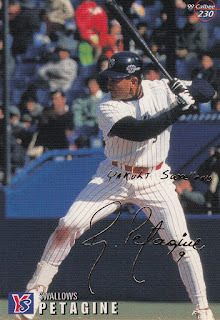 There's a Yokohama Baystars 20th Anniversary set coming out on June 27. 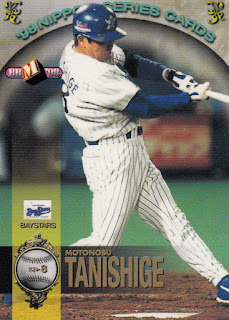 I suspect it will follow the "standard team anniversary set pattern" of a bunch of OB Baystars players plus a bunch of current players along with a couple subsets. The set I'm most interested in though is the BBM Classic set. This set will feature 72 current players using the 1991 BBM design along with 36 OB players using the 2002 BBM All Time Heroes design. (I'm not real excited about the OB players being in that design since that was an OB set in the first place.) The inserts will also be using old designs. And I'm not positive, but I think BBM bought a bunch of old cards, had the players autograph them and are randomly inserting them. I've been waiting for BBM to do some sort of set using old card designs for a while (like Topps Heritage or Archives) so I'm really happy to see this set. I picked up my first ever diecut menko card a few months back. 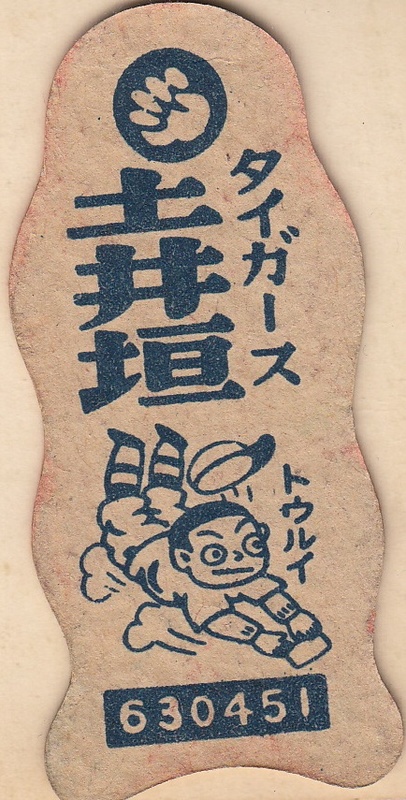 This is a card of Takeshi Doigaki of the Osaka Tigers and it dates from 1947. 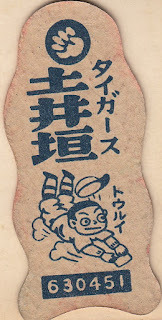 It's part of a set that Engel labels as JDM-1. The graphics remind me a little of Terry Gilliam's animations from Monty Python's Flying Circus. 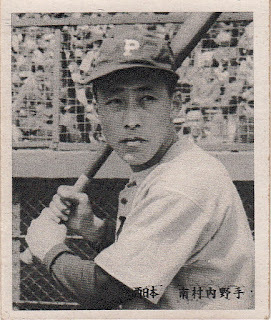 1947 appears to be the first year that baseball cards for professional baseball in Japan exist. 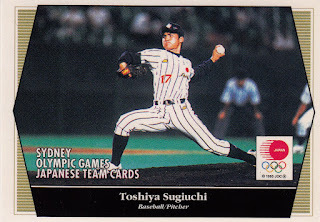 When I browse through Engel's latest vintage card guide, anything pre-war appears to be for either the Tokyo Big Six league or for the 1934 US tour of Japan. Engel lists a bromide set (JBR 73) from 1947 as the earliest post war set - it features players in their 1946 uniforms so it is assumed to be a set from the 1947 pre-season. Engel states that card production in Japan halted in the late 1930's, just after the beginning of professional baseball in Japan so there are no known cards from the earliest years of pro ball. I decided to take in the Japanese Baseball Hall Of Fame when it opened at 10 on the morning of my first full day in Tokyo. I was a little concerned that I wouldn't have enough time to go through it before the first WBC game that day (at noon). It turned out that I was needlessly worried. 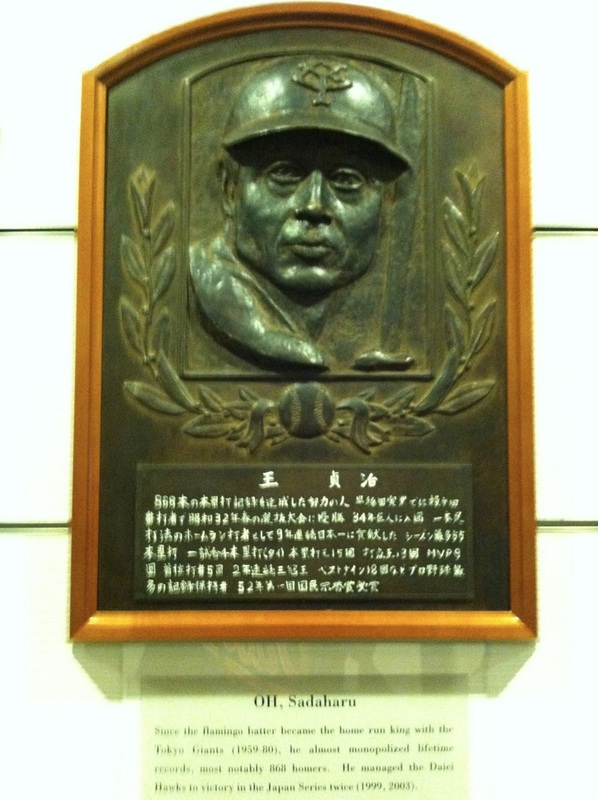 The Hall Of Fame is located on the outside of the Tokyo Dome, between Gate 21 and the To-Do Baseball Shop (where I bought a Chunichi Dragons hat). 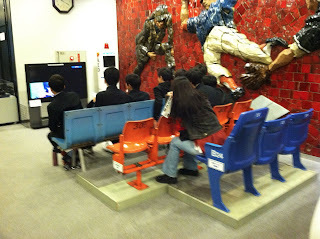 Admission is extremely cheap - only 500 yen. And you can actually save 100 yen by using a coupon from the museum's web site. I want to stress that these were the only four players who had displays in this section. I don't know if they rotate memorabilia from different players through these or if they always just have these four players (a book I have from 1999 that shows pictures from the Hall Of Fame shows these four players' displays as well so maybe they always have them out). 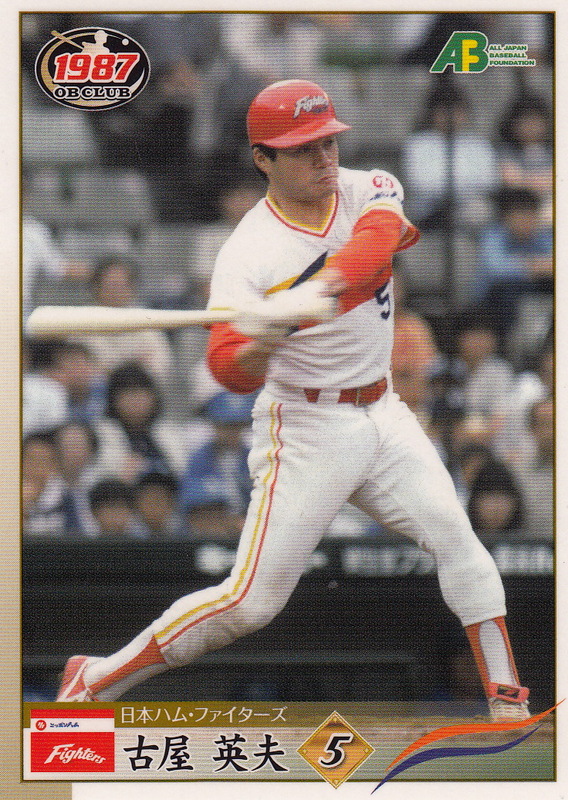 Perhaps it's because they are the all time home run leader (Oh), stolen base leader (Fukumoto), consecutive games played leader (Kinugasa) and victory leader (Kaneda). 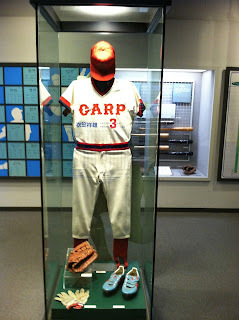 There was also a display case showing American cards of Japanese players. 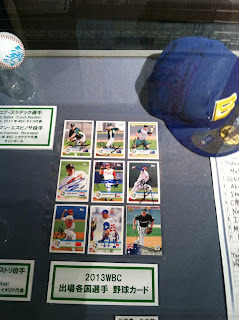 I was very disappointed to not see any Calbee or BBM cards displayed anywhere. 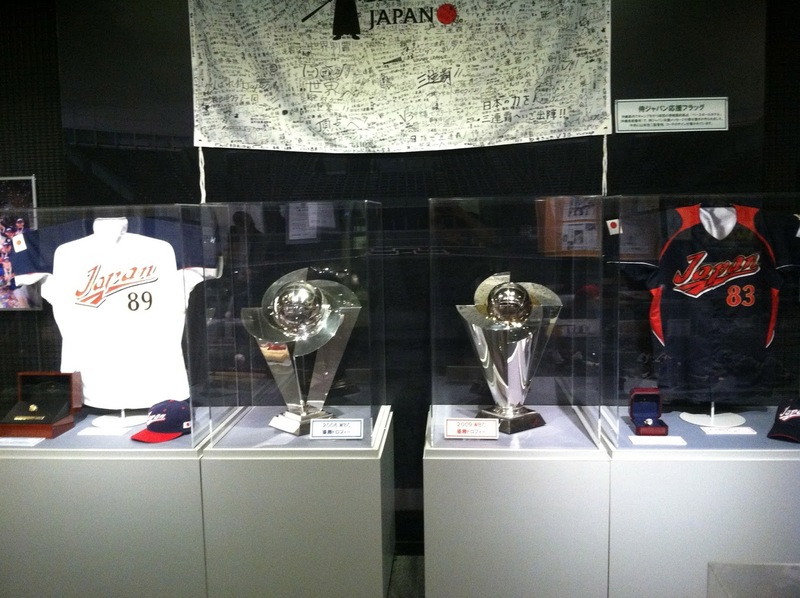 I go all the way to Tokyo and see trophies that were originally awarded about five miles from my house. I think the machine was throwing wiffle balls. I don't think they'd have displays set up on either side otherwise. I think the displays had something to do with stadiums but I didn't get a good look. 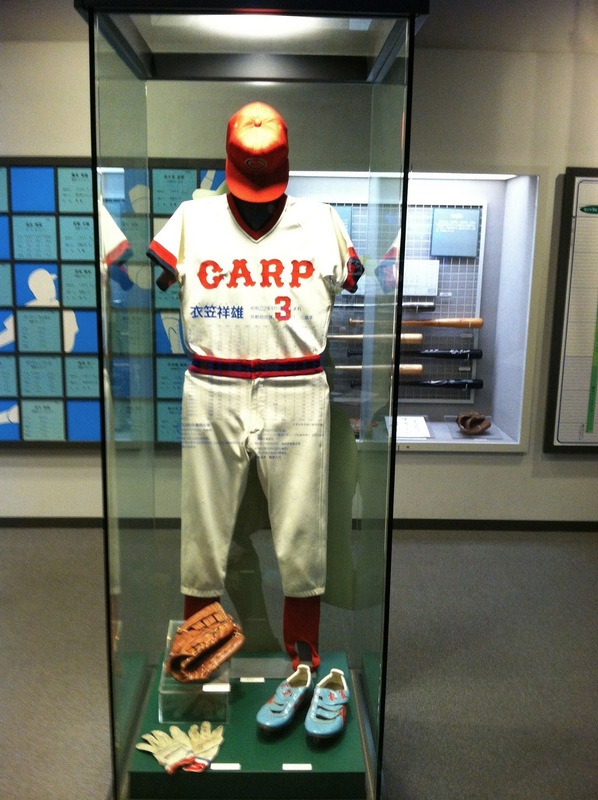 There's also a small library at the Hall Of Fame. Ralph Pearce had suggested that I ask for a particular person that he knew who worked there, but the museum was busy enough that I didn't really want to try. I was thinking that I might make it back there later in the trip but it didn't happen. I was kind of surprised at how small the museum was. I probably didn't spend any more than about 20 minutes there. I was severely jet lagged so I had limited patience to try to figure anything out much. I'd hoped to come back again later in the trip and give it another try but time ran out. I was also surprised that there really wasn't a museum shop. There were a couple items in display cases upstairs in the entrance hall that you could buy if the person running admissions wasn't busy. I think everything they had to offer is on this web page. 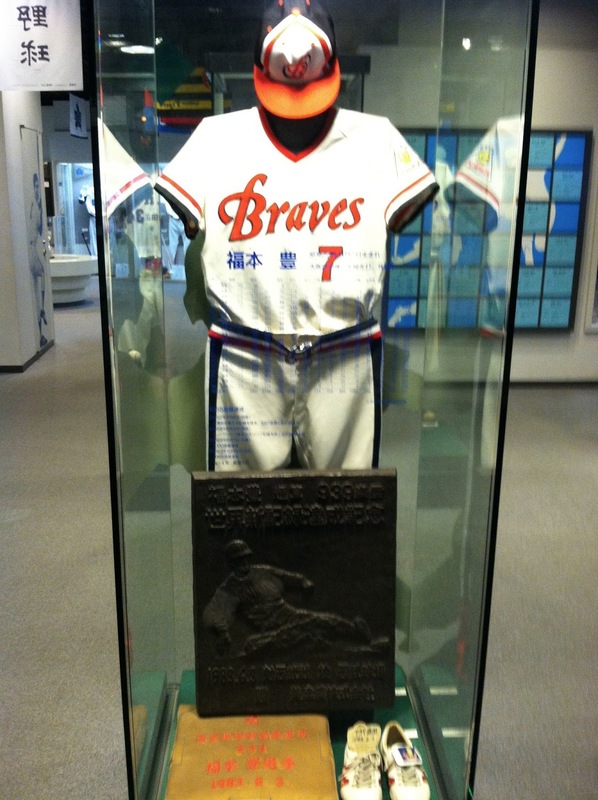 To summarize - I think the Hall Of Fame is worth taking a look at if you're going to Tokyo anyway, but unlike Cooperstown it's not a place that's worth going way out of your way for. It's a great way to kill an hour before a game at the Tokyo Dome. Rakuten Global Market has got a free shipping deal going on with some of the stores that sell through it. They'll pay up to 5000 yen of your shipping costs if you spend 10000 yen at one of the stores. The deal is good through 10 AM Japan Time on Friday morning (9 PM Thursday on the East Coast of the US). Items must be shipped by the end of June to get the free shipping, so you may be able to preorder boxes of cards and take advantage of this deal. I haven't done a thorough look to see what card shops are participating, but I did see that Niki is. 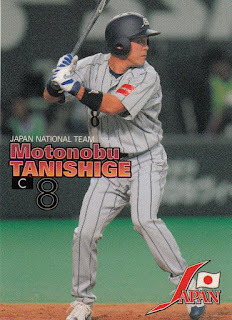 Hitoshi Tamura of the Baystars hit two home runs Friday night against Yomiuri, including a three run sayonora shot in the bottom of the ninth, turning a 10-9 Giant lead into a 12-10 Baystar victory. 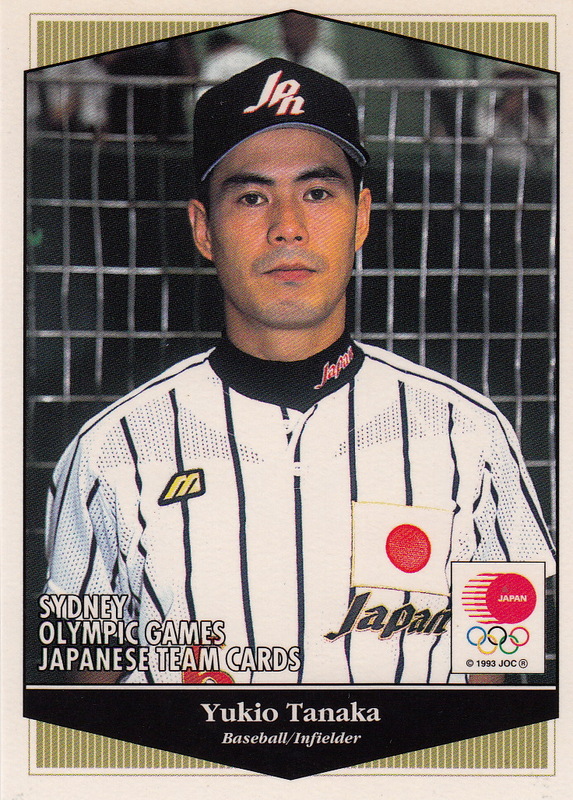 A couple months back Ryan posted what I thought was a very interesting card that he'd found in a shop in Nagoya - a card of 2000 Japanese Olympic Baseball Team member Yoshikazu Doi. 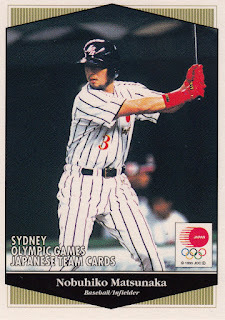 This card was apparently from a larger set that Upper Deck did for the entire Japanese delegation to the Sydney games. I am a sucker for National Team sets but I had never heard of this one so I was very intrigued. 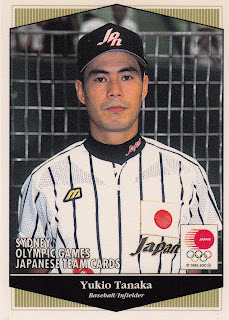 Unlike the previous Olympic teams that were mostly made up of college and/or industrial league players and later Olympic teams that were exclusively NBP players, the 2000 Japanese Olympic baseball team was a hybrid of 10 NBP players, 13 industrial league players and one college player. 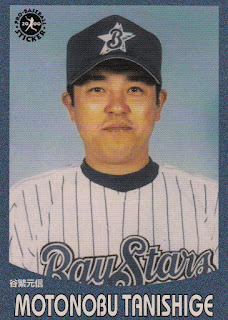 Several of the industrial league players have since gone on to NBP and become stars, including Norihiro Akahoshi, Toshiya Sugiuchi and especially Shinnosuke Abe. Up to now, the only cards I knew of for this team were an eight card subset in the 2001 Calbee set that didn't even include all of the NBP players. 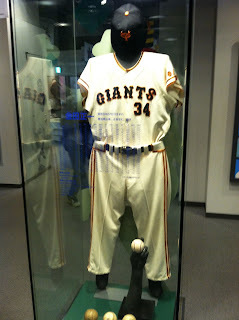 Ryan had only seen the one baseball player along with a bunch of other sports. Doi's card was #222 but he had no idea how many other baseball cards there were (or even if there were any others). I started looking around. I found a lot of 100 or so cards from the set on Yahoo! Auctions Japan that I picked up via kuboTEN. I also found singles from the set at Wrappers in Tokyo. (I don't know if other stores had singles or not because I didn't think to look until I was at Wrappers.) Between these two sources, I've managed to locate 14 cards for the team. What I don't know is how many cards there are and if there are actually cards for all 24 team members. 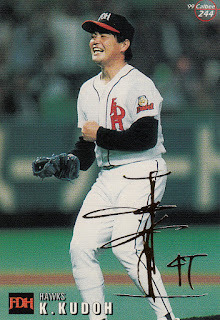 The cards I have so far are numbered between 214 and 230. So that's 17 cards right there. But obviously there could be cards before 214 and after 230, couldn't there? I took a look at the lot of cards I got from the auction and saw that the last number I have before the baseball cards is #207 and the first number after the baseball cards is #232. So the entire subset COULD start at #208 and go to #231. And that would give us 24 cards, enough for the entire team. UPDATE - yeah, it COULD have started at #208, but it doesn't. According to what Jason's found on the web, the subset starts at #213 and goes to #231. So 19 cards in all. It's very hard to find any "pre-rookie" cards of any NBP players (unless they went to one of the Tokyo Big Six schools since 2008) so the idea of being able to find an Abe card from before he was drafted by the Giants is pretty cool. UPDATE - Unfortunately, he doesn't have a card in the set. 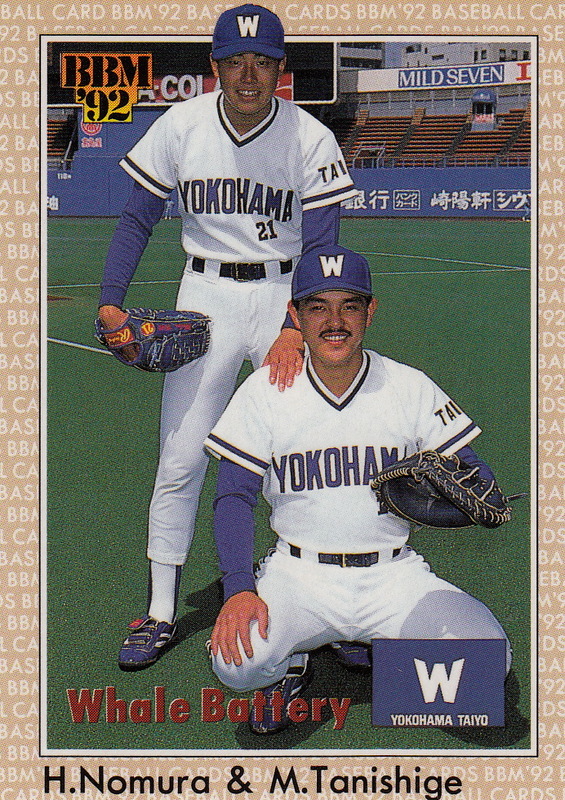 But "pre-rookie" cards of Sugiuchi and Akahoshi are pretty cool too. Many thanks to Jason for filling in the empty spaces. Ho-hum, another day, another 2000 hit milestone reached. Today it was Motonobu Tanishige of the Dragons getting hits 1999 and 2000. If it seems like there's a lot of guys reaching 2000 hits lately, you're right. This is the third one this season and there were three guys last season. 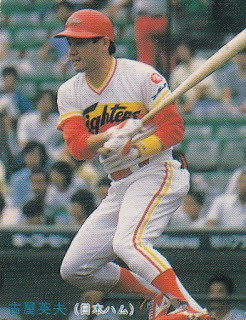 And we're probably not done for the year - Tadahito Iguchi is currently at 1931 hits between NPB (1437) and MLB (494). 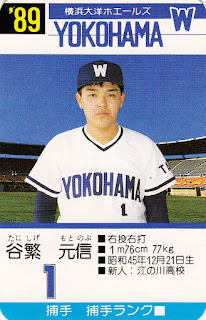 Tanishige was a 1st round pick of the Whales in the 1989 draft (same round as Kenjiro Nomura). He debuted in 1989 and remained with Yokohama through the 2001 season, winning a championship in 1998. The earliest card of Tanishige is from the Takara Whales set in 1989. 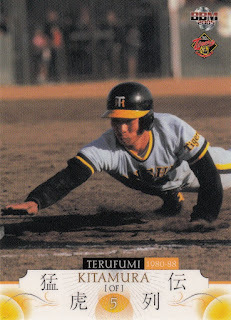 His first Calbee card is #42 of the "small" sized 1990 cards (plus a premium "Big" card). 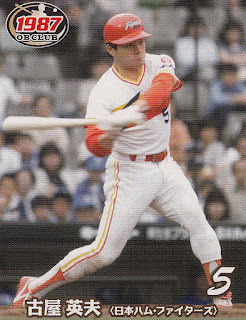 His first BBM card is #200 of the inaugural 1991 set - I believe that he is the only player to have a card in every "flagship" BBM set so far including all of the 1st and 2nd Version sets but I could be wrong. That 1992 card is the only one I've seen with him sporting a mustache. 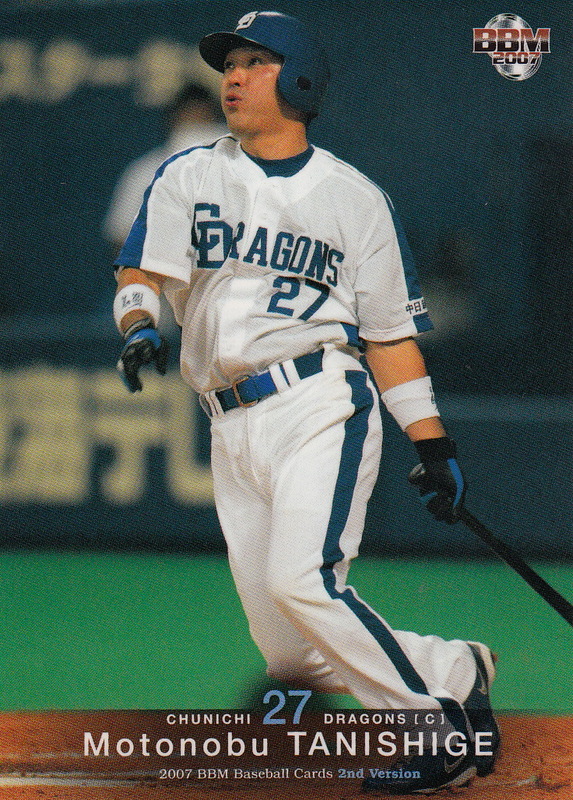 After 13 seasons with the BayStars, Tanishige headed west for Nagoya for the 2002 season. 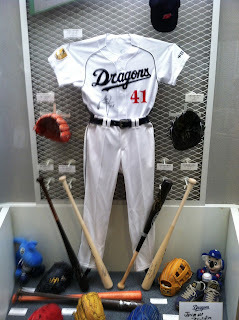 He has remained with the Dragons ever since. 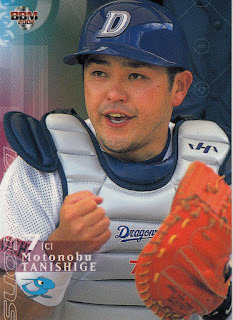 He won another Nippon Series in 2007 and played on the losing side in 2004, 2006, 2010 and 2011. I wanted to talk briefly about a couple other sets I picked up in Japan. There were three older sets that I bought, so they didn't really fit in with the post I did a few weeks back about the opened box sets I got. I picked this set up at Mint Kanda for 1000 yen. I had opened a couple packs of it back when it had come out but I decided that I'd buy the complete set if I could find it at a reasonable price. 1000 yen was extremely reasonable. The set was the first to really establish the "standard pattern" for BBM's team anniversary sets. 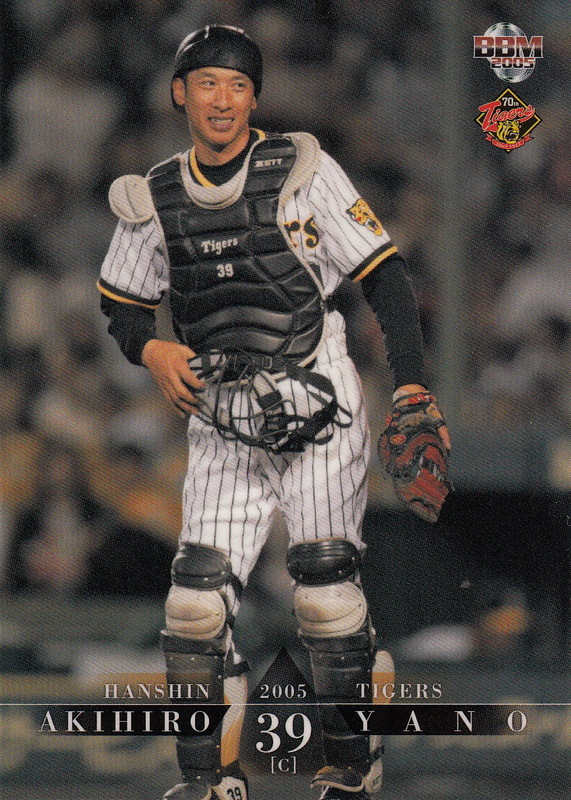 It''s the now standard 99 cards (the 2004 Giants 70th Anniversary set was 104 cards). 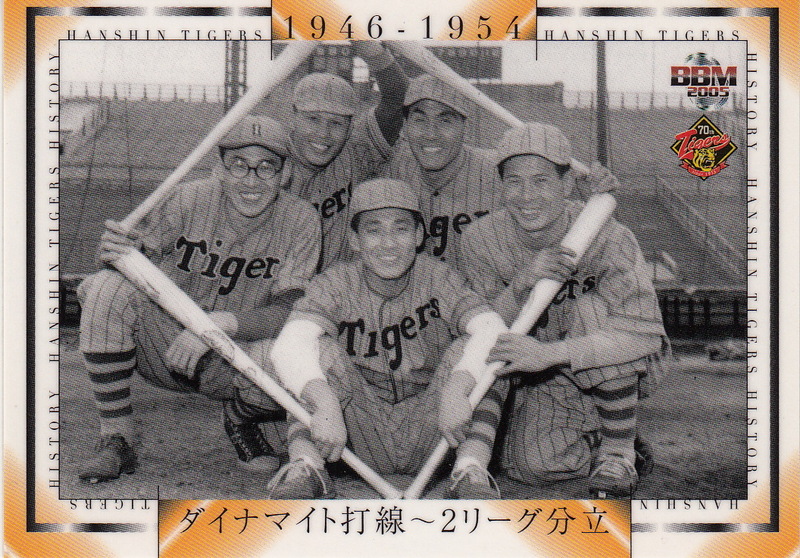 The first seven cards in the set are "team history" cards featuring some significant events in team history. 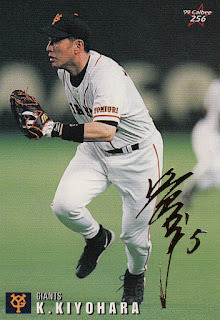 There are 65 cards of OB players and 24 cards of "current" (2005) Tigers players (including then manager Akinobu Okada). 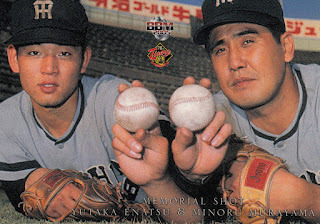 There are also three "Memorial Shot" cards that each feature two of the following players - Yutaka Enatsu, Minoru Murayama and Koichi Tabuchi. The OB players include who you'd expect - Enatsu, Murayama, Tabuchi, Randy Bass, Yoshio Yoshida, Masayuki Kakefu, etc. I haven't noticed anyone obviously missing. As is kind of standard for BBM's OB sets, the player selection is heavy on guys from the 1960's and later. I was not a fan of the set Epoch put out for the All Japan Baseball Foundation in 2011 that featured the year 1987. I thought the player selection was kind of poor and I just wasn't terribly impressed with the set (it was one of the things that made me stop buying the AJBF sets). 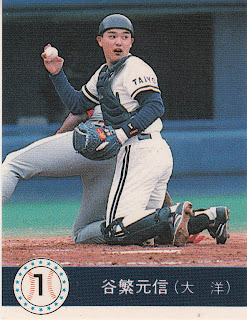 I was intrigued, however, when Ryan mentioned last fall that there was a parallel issue to the set that looked like Calbee cards from 1987. I decided that if I saw some of them, I'd pick them up. Well, at Quad Sports, the very first card shop I went to in Japan, I saw that they had the entire parallel set available for 2500 yen. 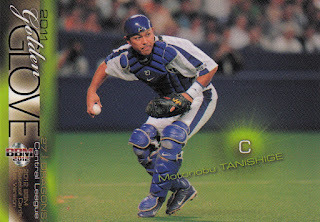 I was pretty excited to finally be in a store where I could find Japanese baseball cards so I kind of got caught up in the moment and bought it. In retrospect, I think I overpaid for it. Don't get me wrong - it's a cool little set. I just think I paid too much for it. 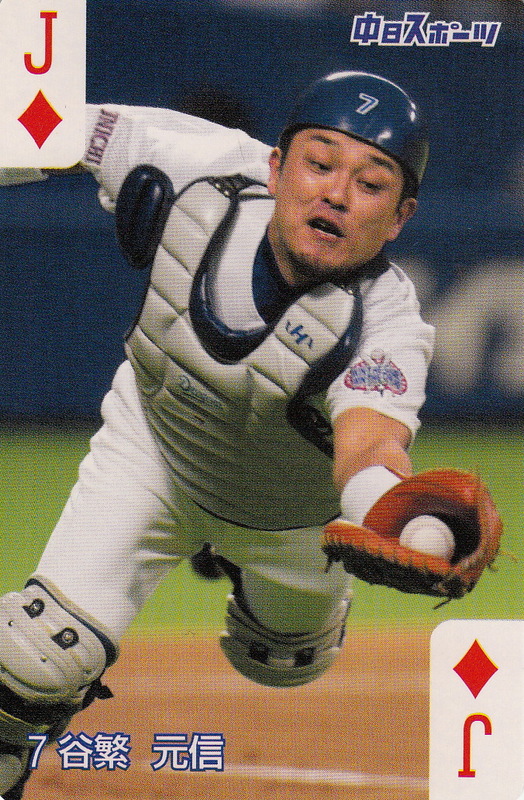 The regular set contains 59 cards, of which 48 are player cards. 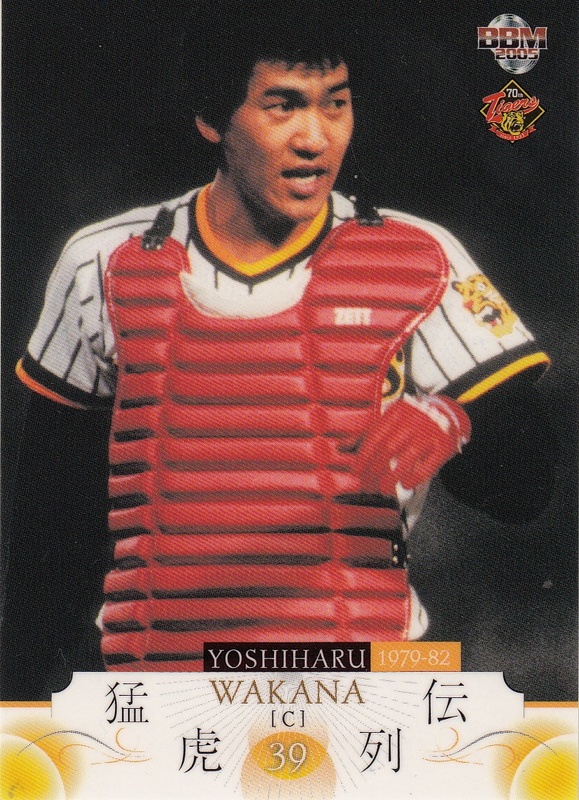 The parallel set features 50 cards - one for each of the 48 player cards plus parallel versions of the "1987 Highlight" cards of the pennant winning managers Sadaharu Oh and Masaaki Mori. The pictures on the parallel cards are identical to the ones on the original cards (which is obvious I guess - otherwise they wouldn't be a parallel then, would they?). 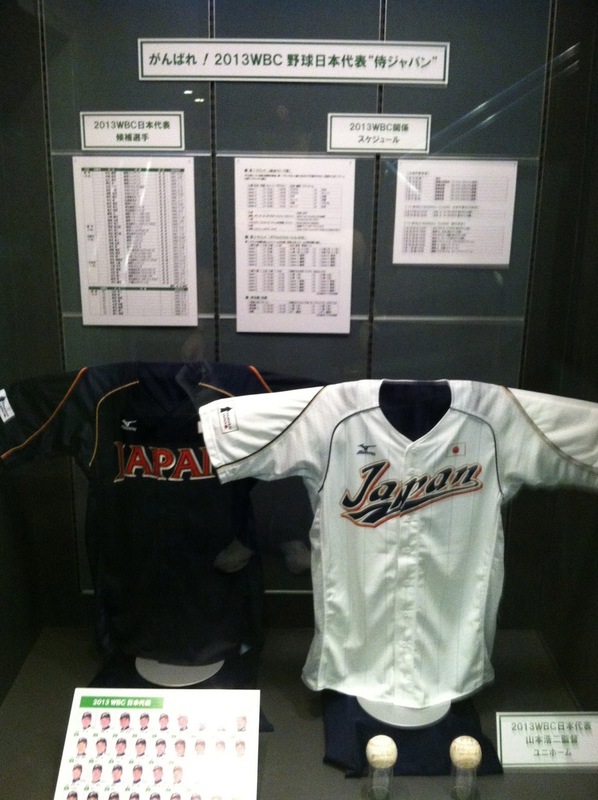 The backs are completely different and vaguely Calbee-ish. There are two different versions - blue backs and brown backs. I have the blue backs. Ryan says that he thinks the blue backs are more rare but I don't know if that's really the case. Ryan also shows that there were similar parallel issues for Epoch's 1977 set as well. I didn't see any of those while I was in Japan. Since the scans get resized when they get displayed, it's not immediately obvious that the parallel is exactly the same size as the Calbee card and both are somewhat smaller than the regular card.